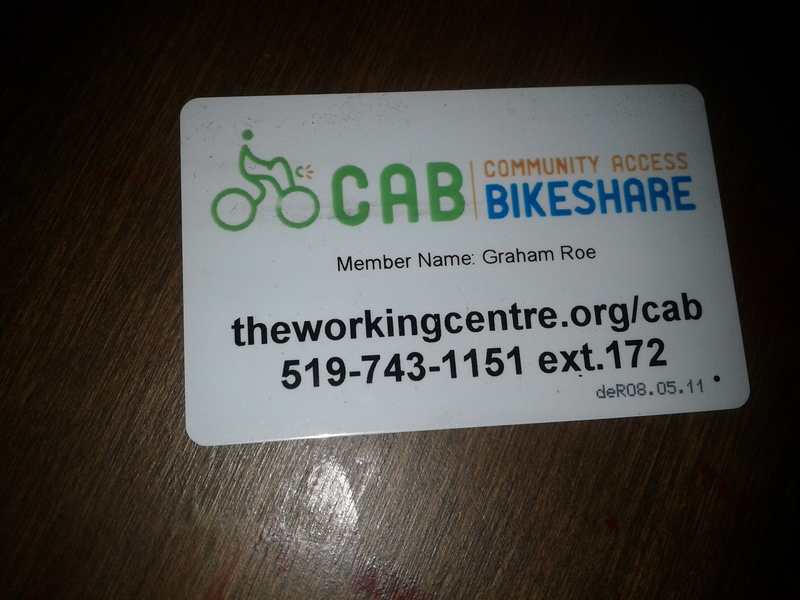 One of the most exciting things I’ve done over the last couple weeks is take out a Bike Share membership with CAB (Community Access Bike Share). The more I use the service the more excited I get about my $30 expenditure. 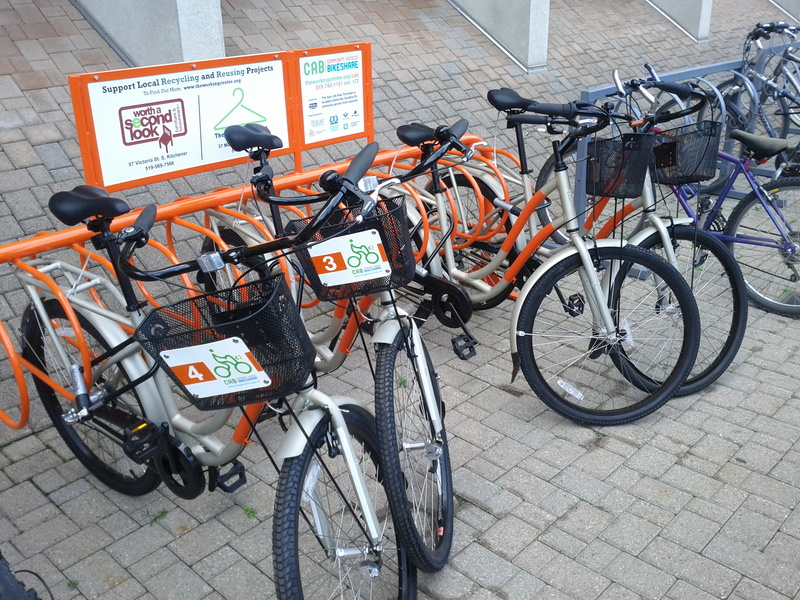 Its a made for Waterloo Region in Waterloo Region, people oriented, affordable bike share that I hope becomes more accessible to the rest of Waterloo Region. It’s a non-profit service where as a community we’re going to discover what it means to share a bicycle (the sesame street sense of the word). Support K-Ws CAB bike share by registering today, with your help we can ensure CAB gets off to a strong sustainable start (for more details read below). I’m one of the lucky ones as I not only work at Sun Life but I also live like 2 blocks away. This bike share differs from a Bixi model in that it’s membership based without a per ride fee and once you take the bike you have a generous 3 hr time limit. At CAB, it’s costing me a flat rate of $30 dollars for the remainder of the season (mid-August to mid-Novemeber). Adrian indicated next year it will be more for the full year, but their goal is affordability (rumour indicates it will be $40 for the entire season, practically free). Having a bicycle parked right outside Sun Life on King Street (where I am currently an IT Project Manager) and also one where I’m a 10 minute walk away from my house is awesome. I mainly use the bike share at lunch to meet friends for lunch, run errands, and go home for lunch. I foresee using it when I’m running late to pick my daughter up after school, I can bike instead of walk. It also allows me to avoid using my personal bicycle where I’d have to leave it locked up all day. At work rumour has it we have 2-3 bicycles stolen every month so it kind of feels like it’s only a matter of time until my bicycle disappears. (That’ll be a subject of another post, I have one friend who has had 5 bicycles stolen from his back yard shed this summer). 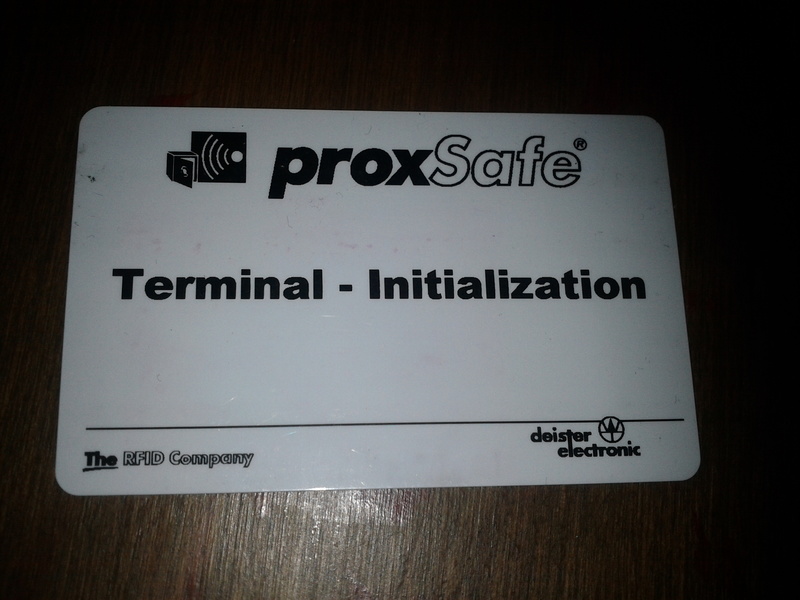 I have an ID card which I tap on what looks like a phone or atm machine. I’m then prompted to enter a PIN number and then select the bicycle # that I want. Once selected the box door unlocks. Upon opening the key box door the bicycle key will be lit up. I simply pull it out and walk like 30 steps to the CAB bike racks. Each bicycle is numbered on the front so it’s easy to match the kryptonite key to the lock. Unlocking the bike can be a bit of a pain, especially in business causal clothes. 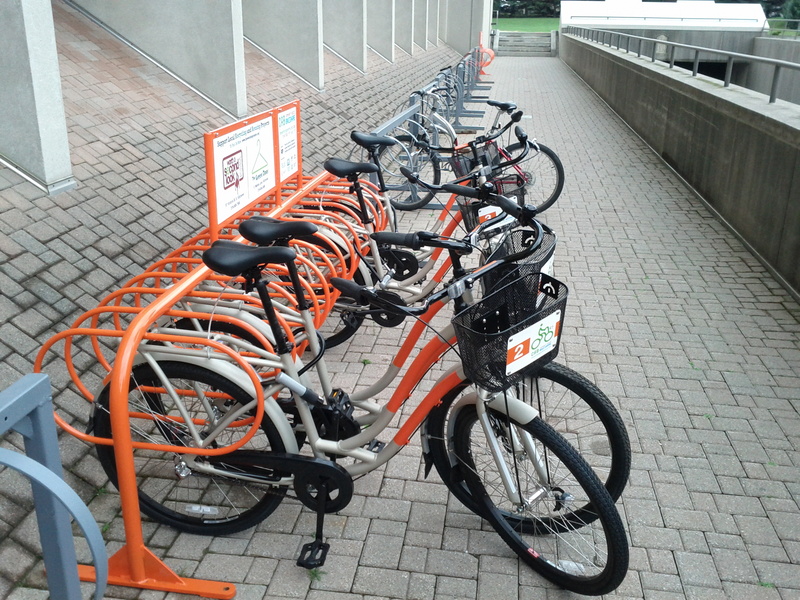 The bike racks put the bicycles fairly close together making difficult to reach the lock. I’d imagine if I wasn’t so tall it could be almost impossible to reach. Once unlocked it’s your responsibility to quickly check the bicycle over, adjust the seat make sure the tire pressure’s good. I’ve been throwing the lock and key into the front basket and away I pedal. Having the lock and key is one of the best parts of this bike share, as it allows you the full freedom of riding a bicycle. The suggested time limit on the bicycle is 3 hours, and it’s a limit that’s borne out of respecting your fellow bike share members. But in this region 3 hours is a lot of time, I don’t really see myself ever using the full time allotment. 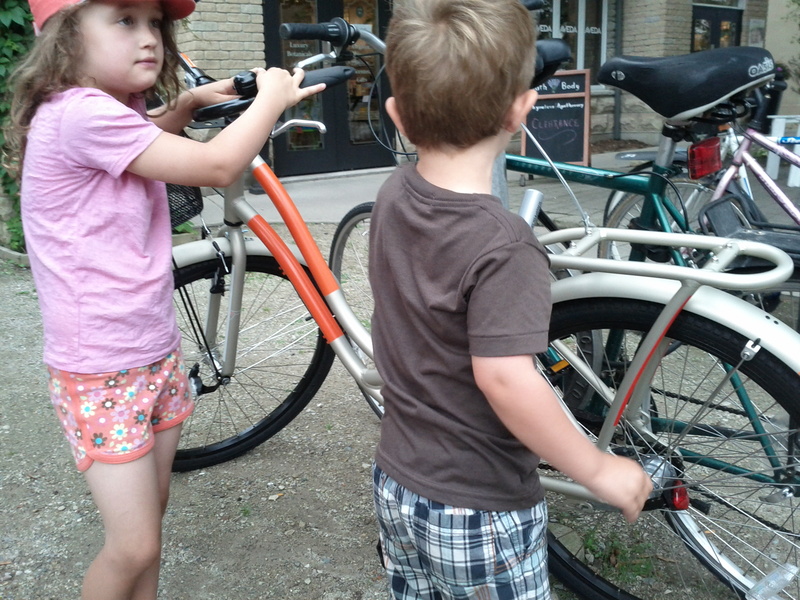 While out and about, you’re responsible for the bike, so its important to use all the best practices for locking a bike. Otherwise the replacement could be coming out of your pocket. Adrian’s far too nice a guy and suggests that every situation is different and at least it’s a conversation and at most it’s replacing the bicycle which is around $470. Returning the bike is a cinch, it’s basically the steps in reverse. Lock up the bicycle. 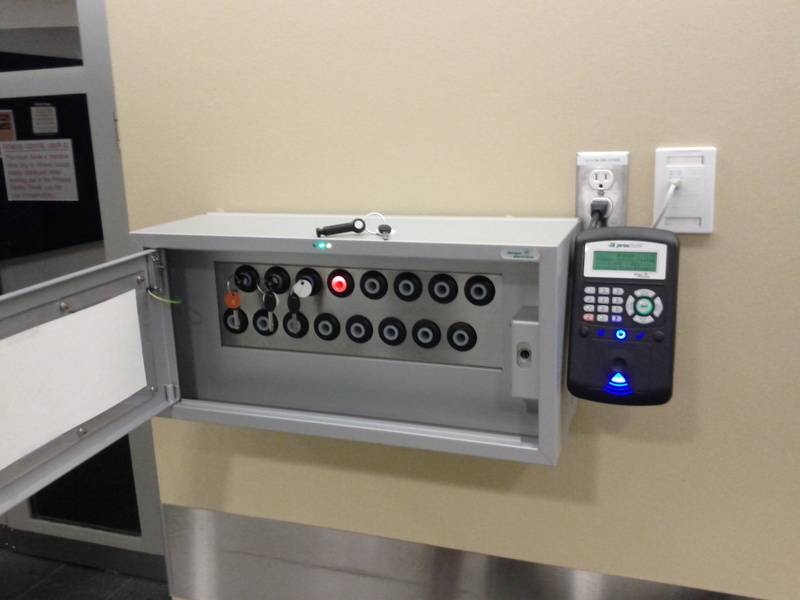 Return to the key lock box (which at Sun Life is open 24 hours). Swipe your ID card and enter your PIN. You’ll be asked if you’re taking or returning a bicycle. Then you’ll be asked to tap your key, which identifies the bicycle number you used. The next prompt is new, it asks you to enter a warning code if the bicycle needs to be repaired before it’s next usage. 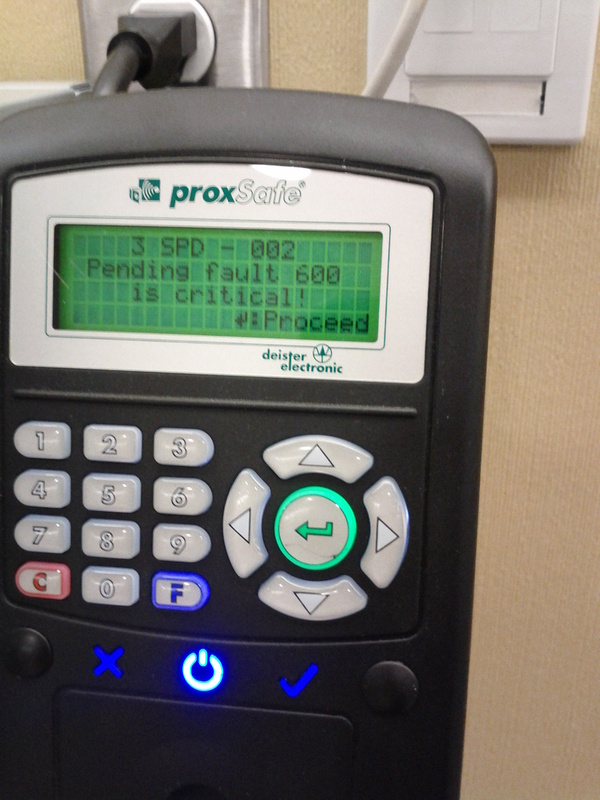 The code is 600 and sends a message to CAB that the bicycle needs servicing. You can then follow up with Adrian via email to let him know what needs to be done. I actually did that to warn one bicycle needed it’s tires pumped up. If the bicycle is fine for the next rider, simply click the ‘enter’ button which opens the lock box door. The hole where your key needs to go will be lit up, place the key in the slot and close the door and your done! It’s easy, affordable and a decent bike to boot. My prediction is the Working Centre bicycle share will be a success. I’m looking forward to more stations, more bicycles and more fellow members. My next CAB post will be a review of riding the Kona CAB bicycle itself. I met my partner and kids for lunch at Seven Shores and they loved playing with Lock and Key. Maybe we need family transferable memberships. Previous Previous post: My Ride with the Police!